Crisis communication is part of crisis management. It has the task of identifying and avoiding crises in advance. If a crisis occurs, crisis communication helps to limit the damage. Normally, the person responsible is in direct and close contact with the company management. This is the only way to realize fast and effective decisions as they are required. A crisis communication plan defines measures that prevent the occurrence of crises or minimize their effects. It defines communication processes and contents that are applied before, during or after a crisis. The task of crisis communication is to identify potential points of attack and to advise management in this regard. Thorough monitoring and clean preparation of information are crucial for this. They form the basis of all further communication processes, from internal information channels to interactions with partners, customers and the public. the turning point or climax of a dangerous development. As a rule, a crisis only turns out to be a crisis after the fact. However, as soon as pre-defined crisis triggers are noticed, the procedure laid down in a crisis communication plan must be automatically unwound. Unfortunately, it’s not that simple. People like to refer to the double meaning of the Chinese character for “crisis” and say that the same character stands for “chance”. That is of course wrong. The Chinese writing is a syllable writing and for the two-syllable word “crisis” stand two characters: 危机 (wei ji). 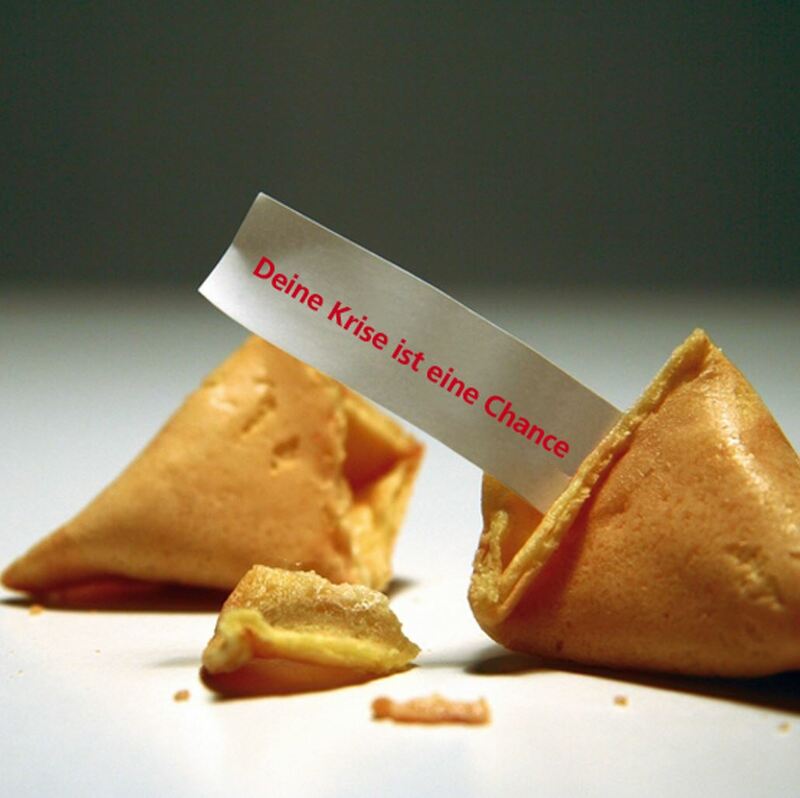 The second syllable corresponds to the first syllable in the Chinese word for “chance”: 机会 (ji hui) and so the chance actually begins – if you like – with the end of the crisis. But both are not identical and you have to survive one in order to perceive the other. Companies and organizations that today have no topic monitoring and no crisis communication plan live dangerously. Via online channels, any information can be reinforced to an uncertain extent. Like in a domino, criticism and malice spread from one platform to the next and could eventually end up in the classic media. What has also changed is the conscientiousness with which news is written and launched into the world. While classical media are subject to media law, individual Internet users have much more leeway to get involved in their own opinions. The more the crisis unfolds, the more important it is to concentrate on the levers that can counteract what is happening. Companies and organisations need to be well prepared. Possible crisis potentials must be identified. The teamwork of the crisis team must work effectively. Specialists from different specialist areas must be informed. In this way it is possible to react sensibly even under time pressure. The argumentation must be stringent, the statements honest right from the start. The public should be continuously informed about crisis management. Offline and above all online. Organizations and companies can be affected by different crises. The task of PR is to develop solutions for conceivable scenarios. Crisis communication focuses on advising companies and organizations on what is ethically and socially correct. We help companies and organizations to observe possible crisis scenarios. Based on these scenarios, we formulate crisis plans with strategies and processes. 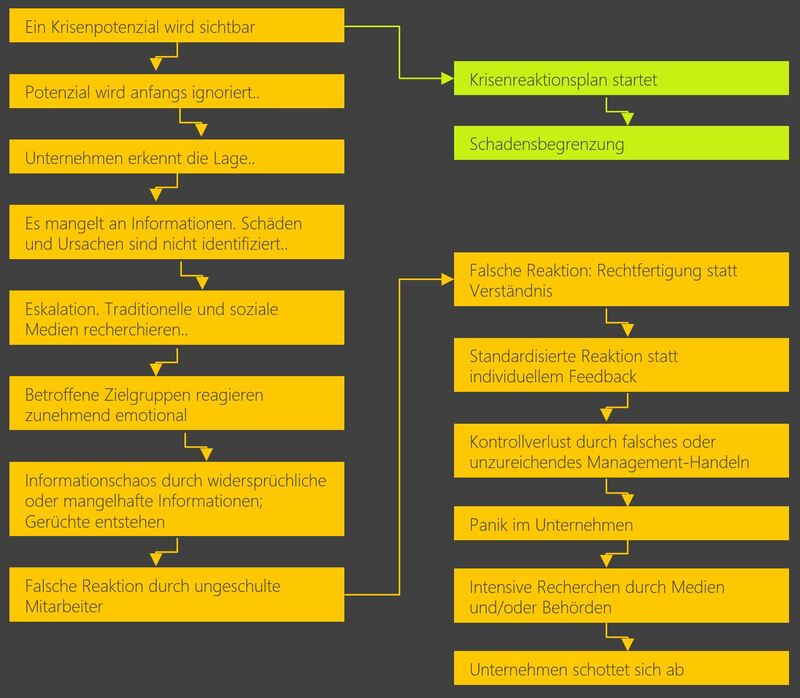 Each situation description exactly defines the responsibilities: Who informs whom and when? Who decides on which escalation steps? Concrete documents are prepared for the most important elements of the scenarios: from customer and employee information and press releases to social media dialogues and campaign websites, which are already technically designed as templates. Crisis PR or crisis communication is always a mixture of prevention and prepared, controlled reaction.